American Airlines Flight 191 was a regularly scheduled passenger flight from O'Hare International Airport in Chicago, Illinois, to Los Angeles International Airport. 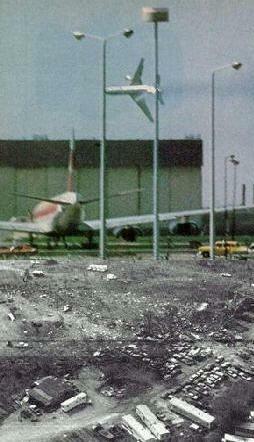 On May 25, 1979, the flight, operated by a McDonnell Douglas DC-10-10 crashed during takeoff from Chicago. The jet had 258 passengers and 13 crew on board, all of whom died in the accident, along with two on the ground. Investigators found that as the jet was carrying out the takeoff rotation, engine number one separated and flipped over the top of the wing. As the engine separated from the aircraft, it damaged the left wing resulting in a retraction of the slats. The left wing aerodynamically stalled while the right continued to produce lift. The jet subsequently rolled to the left, reaching a bank angle of 112 degrees (partially inverted), before impacting with an open field near a trailer park shortly after the end of the runway. The engine separation was attributed to damage to the pylon rigging structure holding the engine to the wing caused by improper maintenance procedures at American Airlines. Contributing to the cause of the accident were the vulnerability of the design of the pylon attach points to maintenance damage and the fact the FAA failed to identify substandard maintenance procedures. Whilst the crash was caused mainly by maintenance errors, the accident was one of a sequence that added to the negative reputation of the DC-10. It remains the deadliest airliner accident on U.S. soil. The aircraft involved was a McDonnell Douglas DC-10-10. It had been delivered new to American Airlines on February 25, 1972, and, at the time of the crash, had logged over 20,000 hours of flight over seven years. The jet was powered by three General Electric CF6-6D engines. A review of the aircraft's flight logs and maintenance records showed that no mechanical discrepancies were noted for May 24, 1979. However, on the day of the accident the records had not been removed from the aircraft as was standard procedure, and were destroyed in the accident. Flight crew; Captain Walter Lux, 53, was one of the most experienced DC-10 pilots in the airline; he had been flying the DC-10 since its introduction eight years earlier. He had around 22,000 hours logged of which about 3,000 were in a DC-10. He was also qualified to pilot seventeen aircraft including the DC-6, DC-7 and Boeing 727. First Officer James Dillard, 49, and Flight Engineer Alfred Udovich, 56, were also very experienced. They shared over 25,000 flying hours between them, of which 1,830 were in the DC-10. The weather on the day of the accident was clear, with a northeast wind at 22 knots (41 km/h). At 14:50 CDT, Flight 191 pushed back from gate K5 and was cleared to taxi to runway 32R. Maintenance personnel who monitored the flight's engine start, push-back, and start of taxi did not observe anything out of the ordinary. At 15:02, the flight was cleared for takeoff and began its takeoff roll down the runway. The rotation sequence was said to be normal until the number one engine and pylon assembly, and about 3 feet of the left wing leading edge, separated from the aircraft, flipping over the top of the wing and landing on the runway. Air traffic controller Ed Rucker, along with other witnesses, observed the aircraft continue to climb to about 300 feet above ground level, while spewing a trail of white vapor of leaking fuel and hydraulic fluid. The pilots were aware that the number one engine had failed, but they could not have known it had fallen off the plane, because the wings and engines were not visible from the cockpit of their aircraft, and no one in the control tower informed the flight crew of what they had seen. Investigators subsequently found that the flight crew thought engine one had only failed, not separated from the aircraft. The first officer raised the nose of the jet up to 14 degrees, thus reducing the airspeed from 165 knots (306 km/h), to the required V2 speed of 153 knots (283 km/h), specified in the emergency procedure for engine failure during takeoff. However, the engine separation had severed lines which contained hydraulic fluid, used for controlling the aircraft's leading edge wing slats for the outboard portion of the left wing. That failure caused that section of the slats to retract under air load, and the slats would have become inoperable because of the loss of the hydraulic fluid. The slat retraction increased the stall speed of the left wing to a speed that was at least 6 knots higher than the prescribed V2 speed, at which the plane was then flying, and thus the left wing stalled. The aircraft then entered a situation called asymmetric lift, when one wing is stalled and the other is still flying. This caused the jet to roll sharply to the left, forcing it into a steep dive, before the aircraft crashed into an open field approximately 4,600 ft (1,400 m) from the end of the runway, striking a hangar at Ravenswood Airport. The fuselage cut a trench into the empty former airfield and the large amount of jet fuel generated a huge fireball. The plume of smoke could be seen from the downtown Chicago Loop. All of the 271 on board were killed by the impact and subsequent fire. Two employees at a repair garage were also killed and two more severely burned. Three residents were injured and five trailers and several automobiles were damaged in a nearby trailer park when wreckage from the jet was thrown by the force of the impact towards them. From an examination of the detached engine, the NTSB concluded that the pylon attachment had been damaged before the crash. Investigators looked at the plane's maintenance history and found that its most recent service was eight weeks before the crash, in which engine number one had been removed from the aircraft, however the pylon, the rigging holding the engine onto the wing, had been damaged during the procedure. The original procedure called for removal of the engine prior to the removal of the engine pylon, but American Airlines had begun to use a procedure that saved approximately 200 man-hours per aircraft and "more importantly from a safety standpoint, it would reduce the number of disconnects (i.e., hydraulic and fuel lines, electrical cables, and wiring) from 72 to 27." The new procedure involved mechanics removing the engine with the pylon as one unit, rather than the engine, and then the pylon. A large forklift was used to support the engine while it was being detached from the wing - a procedure that was found to be extremelly difficult to execute successfully, due to difficulties with holding the engine assembly straight while it was being removed. The field service representative from the manufacturer, McDonnell-Douglas, said it would "not encourage this procedure due to the element of risk" and had so advised American. However, McDonnell-Douglas "does not have the authority to either approve or disapprove the maintenance procedures of its customers." The accident investigation also concluded that the design of the pylon and adjacent surfaces made the parts difficult to service and prone to damage by maintenance crews. The NTSB reported that there were two different approaches to the one-step procedure: using an overhead hoist or using a forklift. United Airlines used a hoist; American and Continental Airlines used a forklift. According to the NTSB, all the cases "wherein impact damage was sustained and cracks found involved the use of the forklift." Under the procedure American used, if the forklift was in the wrong position, the engine would rock like a see-saw and jam against the pylon attachment points. The forklift operator was guided by hand and voice signals; the position had to be spot-on or could cause damage. Management was aware of this. The modification to the aircraft involved in Flight 191 did not go smoothly. Engineers started to disconnect the engine and pylon, but changed shift halfway through. When work continued, the pylon was jammed on the wing and the forklift had to be repositioned. This was important evidence because, in order to disconnect the pylon from the wing, a bolt had to be removed so that the flange could strike the clevis. The procedure used caused an indentation that damaged the clevis pin assembly and created an indentation in the housing of the self-aligning bearing, which in turn weakened the structure sufficiently to cause a small stress fracture. The fracture went unnoticed for several flights, getting worse with each flight. During Flight 191's takeoff, enough force was generated to finally cause the pylon to fail. At the point of rotation, the engine detached and was flipped over the top of the wing. The National Transportation Safety Board determines that the probable cause of this accident was the asymmetrical stall and the ensuing roll of the aircraft because of the uncommanded retraction of the left wing outboard leading edge slats and the loss of stall warning and slat disagreement indication systems resulting from maintenance-induced damage leading to the separation of the No. 1 engine and pylon assembly at a critical point during takeoff. The separation resulted from damage by improper maintenance procedures which led to failure of the pylon structure. Contributing to the-cause of the accident were the vulnerability of the design of the pylon attach points to maintenance damage; the vulnerability of the design of the leading edge slat system to the damage which produced asymmetry; deficiencies in Federal Aviation Administration surveillance and reporting systems which failed to detect and prevent the use of improper maintenance procedures; deficiencies in the practices and communications among the operators, the manufacturer, and the FAA which failed to determine and disseminate the particulars regarding previous maintenance damage incidents; and the intolerance of prescribed operational procedures to this unique emergency. The NTSB determined that the damage to the left wing engine pylon had occurred during an earlier engine change at the American Airlines aircraft maintenance facility in Tulsa, Oklahoma on March 29 and 30, 1979. The evidence came from the flange, a critical part of the pylon assembly.